You will be able to Learn How to use Navigation Gestures on Samsung One UI. 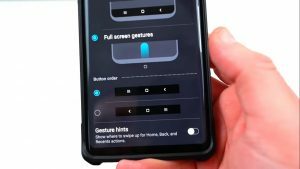 Today we are here with Detail guide on Navigation Gestures on Samsung One UI. Go to Display in the Settings, scroll down a bit and choose Navigation bar> Full screen gestures option. To switch to gesture navigation, make sure the Show and Hide button is on, and choose the Actions for Start, Back and Recent option. Then, at the bottom left, tap the ‘dot’ that hides the navigation bar. I hope to use to understand all about How to use Navigation Gestures on Samsung One UI. If you have any problem then ask in the comment box. We can solve your problem.